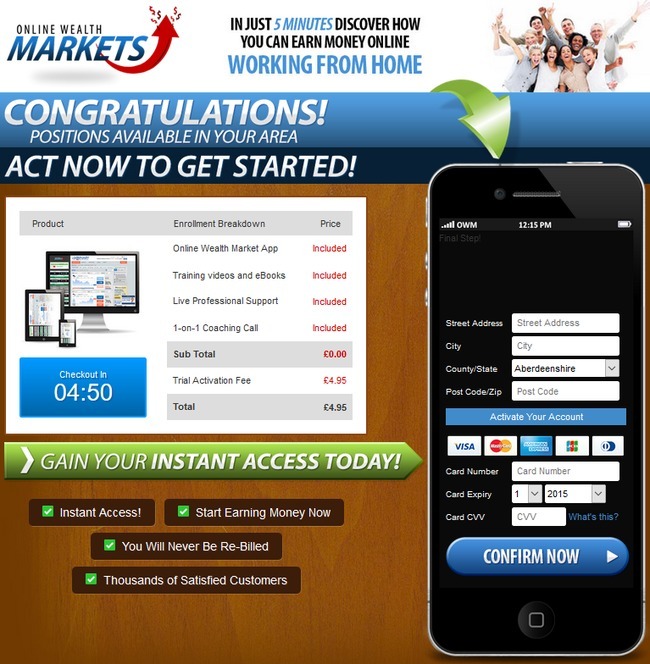 Online Wealth Markets is a binary trading software disguised as an online job. It touts to help you make money from home with no experience, but don’t be fooled. It’s just out to get your money. 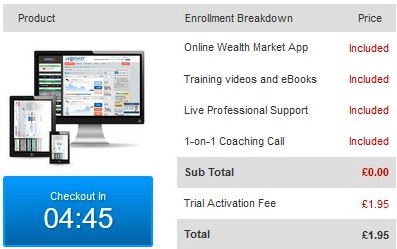 Read this review as we uncover Online Wealth Markets scam. In most cases, our readers reported coming across Online Wealth Markets through a news article that is shared in various social media websites such as Facebook. Before we delve into the review, we want to let you know that the news article is nothing more than a landing page used to promote the scam. There are several fake news articles used to promote the scam, but every single one of them follow the same format. The article will be structured to look like a piece of authentic news – those that you usually come across in various news websites, in order to lower your guard. These articles usually talk about a single mom making tons of money online without selling anything, and they will invariably promote Online Wealth Markets as the money platform. If you try to click on ANYWHERE on the website (different sections, tabs, or links), they will invariably lead you to Online Wealth Markets scam itself. Does a legitimate news website links everything to a single website that sells you a program? Don’t be fooled – this is not an online job! 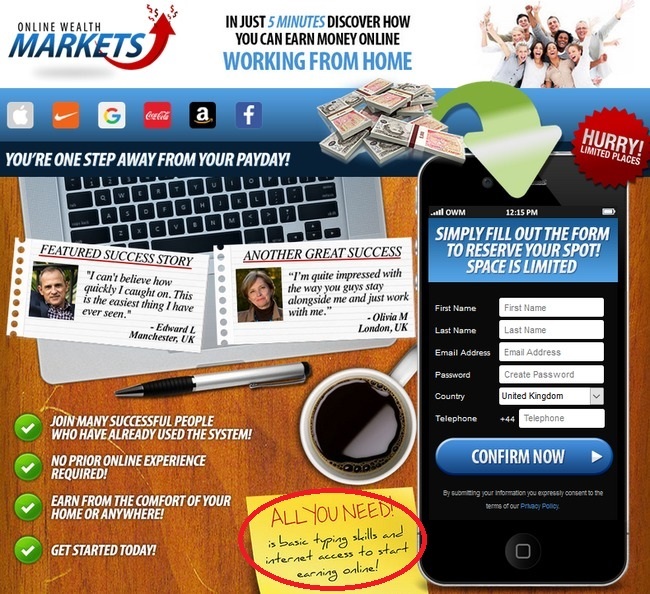 The homepage of Online Wealth Markets is a very generic sales page used in many online scams. Within this homepage, there are a few red flags that you should take note of. Firstly, Online Wealth Markets tries to position itself as an online job by using words like “payday” and “working from home”. It is advertised as if there are limited job spaces available, but this is simply not true. There are NO spots to “reserve”. Even if you visit this page months later, Online Wealth Markets will still be available, unless it’s been taken down by the regulatory for scamming unsuspecting internet users. The form exists to give you the false impression of a job application, and to create a sense of urgency to force you into action. Those who are convinced by the scam simply can’t afford to pass up the opportunity. One thing to note about the form is that you are required to provide your telephone number to confirm your reservation. It’s normal for some online businesses to collect basic information such as your name and email address, but if an unknown website asks for sensitive information such as your phone number, you have to really think twice before giving it out. I have an old number which I use for scam reviews, and I receive unsolicited sales calls from unknown numbers very frequently. This is what happens if you give away your phone number to shady websites such as Online Wealth Markets scam. If you were hesitating to give your number and found this review, please do not proceed further. I’ll reveal what happens after you provide your details and let you see that you did not pass up a good opportunity. For the sake of this review, I provided them with my old number which I’m no longer using. After providing all your details in the previous form, you are simply redirected to their payment page, with no explanation on the nature of the job and what you are supposed to do to make money from home. Up to this point, Online Wealth Markets scam has not revealed what kind of positions they offer, and it seems that they don’t plan to tell you before you pay them money. The truth is – Online Wealth Markets is a binary trading software. You’ll need to deposit money with their designated broker before you can start trading, and it is nothing like a job at all. What is Binary Trading Software? To make sure everyone is on the same page, I’ll explain what’s binary trading briefly. It’s a form of trading that’s been gaining popularity due to its simplicity, compared to other trading instruments such as stocks and Forex. Instead of reading news and analyzing charts, with binary trading, you only guess if an asset’s price will rise or fall after a short period of time, usually between 30 seconds to minutes. You either win, or you lose the bet (hence the name binary, or 2 outcomes). Let’s say I predict that the price of an underlying asset, such as gold will rise 5 minutes from now, and I bet £50 on it. If I am right, I’ll win a certain percentage of what I bet, usually between 60% to 80%. So if I guess correctly, I win £40 when my 5-minute contract expires. If I’m wrong, I lose the entire sum that I bet. This makes binary options not that different from gambling. There’s no good way of predicting the price of a market in such a short period of time. Even if you manage a 50% win rate, you’ll still lose money given the imbalanced winning vs losing payout. Back to Online Wealth Markets. Did you notice that there’s a countdown timer in the payment page? You only have 5 minutes to make your payment and checkout. There’s actually no real reason to rush you through, other than to create an illusion of limited time offer. People generally like limited time offer, and by placing a countdown timer, it will force a few more impulse purchases. If you refresh the webpage, you’ll realize that the timer refreshes itself. It’s just a computer script that is set to 5 minutes every time you load the webpage. This is a widely used tactic in online scams, and the same tactic has been used in other binary trading scams such as Free Money System and Quick Cash System. As if using a fake timer is not enough, Online Wealth Markets is adding a discount for you if you try to exit the payment page. Instead of £4.95, you now only pay £1.95 to access their system. They really want you to make an impulse purchase. Why Is Online Wealth Markets Promoting Their Software? If you think that Online Wealth Markets only earns money when you buy their software, you are wrong. They don’t earn much from your purchase, but they earn a lot from you in the form of ongoing commissions when you use their software. If you decide to purchase Online Wealth Markets, you’ll be required to sign up with their designated broker, Banc de Binary. They earn a sum of referral fees right there when you make your initial deposit with Banc de Binary. The minimum deposit for Banc de Binary is £250. Keep in mind that you cannot use Online Wealth Markets software with any other brokers. Every time you trade with their software, the team behind Online Wealth Markets earns a commission off you. Regardless of whether you win or lose money, Online Wealth Markets will get a profit as long as you are still trading with their software. Should I Buy Online Wealth Markets? As we’ve said in the review earlier, we don’t recommend binary options as a way to make money online. It’s not that different from gambling, and using a trading software like Online Wealth Markets still puts you at great risk. You are essentially putting your hopes and your entire investment in a different form of gambling. I’d like to applaud u for ur advice n input to everyone esp about this subject matter. ur always on point n prompt. was really on way to trade in binary options as u mentioned its not good idea..
I’m currently trading with Financika what’s ur views on them? what other platforms can I trade on? Hi there, Financika is a Forex broker, so it’s slightly different from binary options. With that said, if you are an experienced trader, Forex might work for you. However, 95% of Forex traders lose money, so please be extra careful with your trades. Depending on your location, Oanda and XTrade brokers are viable alternatives. I was trading Forex for 6 months with limited success before switching to building an online business with Wealthy Affiliate, and I have to say it’s much more stable and predictable. If you are struggling with Forex, you might want to switch to another method to make money online. I’ve been contacted by Bac De Binary. Are they genuine. In short, they are not. They are one of the partnered brokers of online wealth markets scam to make money off their victims. Better Business Bureau gave it an “F” rating (worst rating). SEC filed a complaint against it in 2013 for operating under radar. It’s as shady as it gets. Regarding to the online wealth market,I have deposited USD 250 to them and also received called from them for training session and also sending my particular to complete the registration. I make the payment by usind debit card and I go to check for my card balance after the day I make the payment and notice that my balance has been deducted for that amount. I only realized that it’s a scam after reading your review. Then, I write an email to my bank for cancelling the payment as suggested and still got no reply. I also reply email that asking for training session saying that I’m not free for that training session. They keep on calling me after that but I didn’t answer it. Is it OK for me to not answering the call? Also, is it ok for me to apply for refund from the broker before I get reply from my bank? Since it’s a debit card transfer (instead of credit transfer), there is little help that can be offered by your bank. Unlike credit transfer, a debit transfer isn’t covered by federal legal protections, so you’ll have to dispute with the broker. First, make sure you turn off the auto trading feature of online wealth markets software. Then write in to request a refund from your broker. Check if the $250 is intact in your trading account, and don’t accept any trading bonus. If you do, you may be required to perform certain number of trades before you can withdraw, which will incur significant losses. thank you for the information. My account balance still remain the USD 250. But I read for the withdraw page at the broker site and they mentioned that I have to verify my account by sending them photo of my id, driving licence,utility bill, debit card (back and front) in order to request for withdraw.I’m hesitate to send them this photo as I’m not sure they will keep it confidential or misuse it. Any comment for this? Sorry for missing out your comment. Have you withdrawn your fund already? I just sign up Online Wealth Market and I also give the details about my debit card. But my account are not activate yet. What risk do I need carry??? By now you should’ve received a call by the broker’s sales manager. If you haven’t, expect a call from them and their pressure to make you fund more. In any case, don’t activate the software. Request for a fund withdrawal with the broker’s customer support. Don’t accept any trading bonus as well, or you might face problem withdrawing your money. Hi can someone hear me ? I’m in trap now I had also bank in them about USD250 but my bank there are still hold amount so can I cancel it through the bank ??? If your broker account still has $250 in it and you haven’t accepted any trading bonus, you can write to your broker to withdraw your fund. 100 USD is still remaining. Please advise me how to get money back. nd my CC details are with them. is it safe?? You can write in a request to them to withdraw the remaining sum. You’ll most likely receive calls from the sales manager persuading you to stay, just be firm and insist to withdraw your remaining sum. Your credit card info should be safe, since they need your agreement for further deposits. Hi Elvie, do give me a link if you have it so I can take a look. As a general rule of thumb, if it promises you quick wealth without much work at all, stay away from it. I have made the big mistake of falling for the scam. I gave them all my card details and got my account funded too on the advice of the so called account manager who just called and made me invest in assets assuring me of profit. Next thing I know is my money is gone, God knows where and not realising the complexity of the situation I even got bonus added. Now I don’t know what to do. They don’t answer questions. They have my credit card details. What do I do? I tried to save 635 $ left by giving a withdrawal request but they deposited only 235$ after 10 days of getting the request. I complained to the customer service at binary and they sent a mail on 18th August that they will deposit 400$ now and that the amount will be credited to my card soon. Nothing yet. Is there anyway in which I can get my money (2500$) back? Still a bit of hope clings on to me. It appears that you have invested a lot into it. What you can do is to keep following up on the remaining $400 that hasn’t been credited to you just yet. Keep getting back to their customer service until you get back your $400. Unfortunately, as for the amount lost to trading ($1865 – if not mistaken), you’ll have to take it as a lesson and move on. It’s next to impossible to recover it as it has been lost to the market via the scam software. All the best to you, Ayesha. If it shows error your transaction shouldn’t have gone through. Let me know if there’s any update about it. IM LOOKING FOR WORK ONLINE YOU CANT ASSIST PLEASE. If you’re looking for legitimate work online, check out my recommendation at the end of the article. Hi i made a huge mistake on signing up for online wealth market. I would really like to know is there anyone who have gotten their withdrawal back??? I made a 500 dollar withdrawal myself a few days ago but its still pending. Would really like answers tq. i have given my Phone number but on final step i dint provide them with my CARD details. as i am now registered with them and they send me an confirmation email so here is my question how i can unsubscribe and take off my registration. as i did not provide any payment process. Unfortunately there’s no way to withdraw your number once it’s been provided. It’s in their database. Email wise, try to look for “unsubscribe” option at the bottom of emails that they send to you. Unfortunately, once your phone number is given out there’s no way to cancel it. However when you receive the sales calls, you can try to block their numbers. But you are really lucky that you didn’t give out your credit card number, otherwise it will be more troublesome as described by many other readers below. The only thing you can do is to call up the broker’s customer service and request for withdrawal. If you have not accepted any trading bonus, you are entitled for full withdrawal. Do update us here if there’s new development. Good luck. Hi so have you gotten your money back ? So I got sucked in like all the above people. I have filled in the details but I keep rejecting their calls. Do you know if that will be enough for them to not take any money and leave me alone or do I have to answer and tell them no? Without verbal consent they can’t take your money from you, so that should be enough to keep your money safe. However it would still be wise to monitor your account for any unauthorized charges in the next few weeks. HEY! What im gonna do? Did you sign up for the scam? yea 🙁 how? i even paid for it using CC, few days ago i called to Bank and they said payment still pending. I’m not sure for now. Bank officer asked me to monitor my account. After i came this website and read all the comment i was regret 🙁 and they keep calling me these few day, i rejected to answer. Can the bank cancel the transaction? They keep calling you so they can get a verbal confirmation before they can deduct the fund. You can either ignore the calls, or pick up and firmly reject them. It’s wise to monitor your account for a few weeks to come to make sure there are no unauthorized charges. Hai Edward, i already signed in for this online wealth market and give all my details. i also received call from London . And i already give my consent regarding the money which i really regret now. However when they want to call with the bank, my phone number is not active for international transfer. They ask me to call the bank tomorrow to activate my phone number. In this case, they can’t deduct $250 from my bank account , is it ? Besides that, my money in that account most probably less than 20$ . What should i do now ? Is your card a debit card or a credit card? In any case, it seems like they can’t deduct it for now. You can call up your bank and request them to cancel the pending transaction, if it’s already been registered. You’ll most probably receive calls from the broker again, don’t yield into their pressure. Unfortunately found this after sign up. Use my friend’s credit card. Gave out the credit card details. Didn’t charge for the $4.95 and my friend said there’s no transaction maybe because the card reached the limits. Get the call but i didn’t pick up. Now worried do they will take money from my friend’s credit card? It’s possible that the transaction didn’t go through. However it may be better to check with the bank to make sure there’s no pending transaction for $4.95, and cancel it if there is. Also, monitor the account statement for the next few weeks to make sure there are no unauthorized charges. Most importantly, don’t agree to fund your account if you accidentally pick up the broker’s sales call. Hi Duane, take it as a lesson and move on. I’ve had similar experience, the best you can make out of it is to learn your lesson and avoid scams like plague in the future. Please take time to go through the training in WA. It’s legitimate, but you have to put in the work to make it work, just like any other legitimate money making process. Look out for scams in the future! Just wanna ask as i have filled up everything including my debit card number and CVV. I haven’t activated it yet and didn’t paid $5 but 1 lady named michelle is keep on calling me. Should i be worried dat they can deduct $5 or $250 to my account soon? Hi Shieldene, Michelle is the sales manager being assigned to get you to fund your account. They need your verbal consent over the phone before they can deduct your money, so be firm and refuse funding your account. With that said, it’s safer to monitor your account for the time being. If you see unauthorized deduction (usually $250), file a complaint to your broker immediately and ask for refund. SA Wealth System is just a re-branded Aussie Method scam. Take a look at our review of Aussie Method vs the homepage of SA Wealth System and you’ll understand. These scams require you to commit financially before they tell you exactly what you’re getting into. And this is an important hallmark of online scams. Wealthy Affiliate on the other hand requires no financial commitment from you to get started. You can sign up for a free account and try it out. You just have to be willing to learn and if it’s not for you, you can walk away knowing that you didn’t lose anything to it. So I paid for both the 5$ charge and the 250$ over the phone.. I went to my bank to cancel my bank account and they told me I couldnt because of the charge pending, they told me it is a month and a half process to get your money back, So I just cancelled the card I used to pay everything… I just sent an email to complaints@bbinary.com which is the broker asking for my money to be deposit back into my account. Is that enough? Thank you for your review, I almost fell for this scam because the first two hits on Google were good reviews by James from best binary option signal and Jasmine from quintup.com. Plus an article on my news feed on facebook about a single mom with kids working 10-15 hrs a wk making 8000 dollars a month was very convincing – http://dailynews-reports.com/au/workathome/851/?c1=Victoria. Thank you again for your help Edward and providing good valuable information so people like me who are trying to make a living, aren’t scammed at every corner . Hi Vanessa, unfortunately you really have to be vigilant when it comes to doing research because many review sites are making fake reviews. I’ve come across many readers who claim they nearly fell for the scam due to the fake news report. I may just add it into the review to warn future readers. Unfortunately I registered in Online Wealth Market site and given all details of the credit card. Normally Bank will send the One Time Password message for the deduction from Credit Card. When I haven’t got the message, I got the doubt. So I called the bank and blocked my card. When I searched in GOOGLE about this, I found this website. It tells every thing clearly. Edward, Appreciating your efforts and the appreciation goes to the people who wrote their experiences about this to help other people. I am just about to give my credit card details…omg thanks for the info. Anything good online to try so I can make money? Hi Paia, glad that it helps you. I’ve written a detailed guide to help people understand how to make money online, you might want to read it – The Ultimate Guide to Building Your First Money Website. If you want to know about the right place to get started, read this – Real Way to Make Money Online. Hi Liz, glad that it helps! hi. i tried to join in online wealth market. but i have doubt to put my credit card number. so i didnt finish the transaction. then after a week i received a voice message saying to call them asap for bank to bank transfer. then i check the number that they want me to call and its a scamer from UK. then they keep calling me on my phone. first he ask me if i am tiffany. i said what? then he dropped the phone. then few days later he called me again he said he is from online wealth then i dropped the call. so obious that they are scammer. EVERYTHING EDWARD SAID IS TRUE. dont let them fool you and get your money. 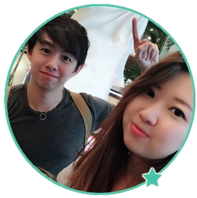 and take note 。　DON’T ALSO BELIEVE IN THIS GUY NAME JAMES FROM http://www.bestbinaryoptionssignal.com/ he make people believe that online wealth is not a scam. im sure he also work with them. My name is Jonathan, and I have looking and searching for genuine Online Wealth Marketing platforms /companies. Because, I’m a single parent and seeking something to do at home “generating” source of income to support my family. Can you please advise me, which sites I could visit / seeking from in that regards. It’s import! Your prompt response will be highly appreciated.. If you are not looking to get rich quick online (don’t fall into these traps! ), then take a look at my recommendation – Wealthy Affiliate. I’ve used the very same platform to start my first website and build it to generating more than $1,000/month now. If you want to know more details on how it works, read my review through the link at the end of this article. DON’T BELIEVE IN THIS ONLINE WEALTH MARKET SIR. IF YOU ARE LOOKING FOR A ONLINE JOB YOU CAN TRY TO WORK IN SUTHERLAND. AS A CALL CENTER AGENT. ALL YOU NEED TO HAVE IS A STRONG INTERNET CONNECTION AND COMPUTER. AND QUIET PLACE. Hi Johanna, be cautious if you are still investing with them. KIPI has been put under the investigation by National Consumer Commission (NCC) by Reserve Bank. I haven’t invested in KIPI before, but looking at the structure of how it works, it’s highly similar to some other pyramid scheme scams that I’ve been introduced before. I signed up with this online market but good enough i had no balance on my debit card. but when they called me they told me i had insufficient funds thus no deposit made. Can they go ahead and withdraw money from my account if it receives any money without my approval? Hi Mark, did you make it clear in the conversation that you don’t want to fund your account? If you didn’t refuse outright they might still deduct the fund from your account. Just keep an eye for any unauthorized charges. Did you give them verbal consent to deposit your account? If they call you again clearly refuse to fund the account, they have to record every call they make to you. For safety sake it’ll be better to watch your balance and ring them up if you see $250 deduction. Yes, if it’s not too inconvenient, that would be the safest choice. Similar to others, have you picked up their call and refuse funding? If you did you should be safe, they have to record all the phone calls. So they’ll try to get your verbal consent to deposit, don’t fall for the trading bonus that they might extend to you. It’s a way to trap your money until you perform a number of trades, which by then you would’ve lost all your fund. could you please explain the compete process/procedure which includes the account opening and ways of getting money. and also how you can prove that the site is genuine especially a beginner like me. Online Wealth Markets is a scam, and it is in no way genuine. 1. Why you keep on suggesting for Wealthy Affiliate? 2. What if Wealthy Affiliate a sort of scam too? 1. Wealthy Affiliate is the turning point in which I started making money online (I lost a total of $15,000 before that), which is why I suggest it to my readers. If you want, you can choose not to put any money into it, since starter membership is free with no obligation to upgrade. 2. Scams work by trapping you with hypes and you won’t really know what you are paying for. Wealthy Affiliate works the exact opposite way – you can try out their courses for free, and only upgrade if you want to advance your skills. In other words, they have nothing to hide unlike scams. I have already provided them with my phone number. However, they do not have any other information including my bank account yet. Am I still safe? When they call, can I just ignore them so that they can’t have my verbal consent? If they don’t have any other information about your bank account yet, it’ll be fine. They’ll try calling you and get you to fund your account. You can choose to ignore them or to refuse funding. Actually i already pay $4.95 and have provided information about no of prepaid card and no of ccv.. The balance in that prepaid card only $5.. I think, I not going to top up that prepaid card.. I got call from online wealth market and say I will deposit $250 later on… but they keep calling.. I ignore all the call. I have been unsubscribed to this from the email. It because I hve been read ‘online wealth markets’ privacy policies somewhere on website but I am not sure if it’s their privacy policies..Their privacy policies is like this ‘if unsubscribed, the service and product they provided will suspend’…. they’re really annoying… What I can do Edward? You should definitely not top up the prepaid card. And consider $4.95 lost and move on, because it’s extremely difficult to get a refund out of scams ike this. If you really wish to make money online using a genuine program, you should look at Wealthy Affiliate instead. Hi, although I’m skeptical about the scammers upholding their promise in the policy, it might be worth a try to unsubscribe from their list to halt the transactions. What if I already provide my bank account and even my 3 digit behind my card. They are clearly trying to get more out of you at this point. You may not be able to close your account, but you definitely have the right to withdraw your money. It’s YOUR account, insist that you want to withdraw it. However, if they offer trading bonus, make sure you don’t accept it. If you do, you may have to perform a certain number of trades before you can withdraw your money. However I used my Cheque card for this. If you receive calls again, pick it up and be very firm that you don’t want to fund your account. If they have your verbal consent, they can deduct money from you account. Every call they make to you is recorded. I’ll recommend that you at least monitor your card for any unauthorized deductions. If cancelling the card gives you a peace of mind, it’s a safe option too. Hi, I just came accross your article. I fell for it, they have my card number and the 3 digit number at the back. I haven’t made the $250 deposit as yet. I got a call from one of the brokers in London asking me if I can deposit. I told her I don’t have cash at the moment and I’ll only deposit next week. But she keeps calling and Iv ignored her calls because now her persistence has made me suspicious. Am I still safe ? because I’m thinking of calling the bank and cancelling my card. Hi Chloe, they have several rotating landing pages, that’s why you see different images when you revisit the link sometimes. I just came across your article after I registered. I keep getting calls from them and they won’t let me remove my account. How can I stop getting calls from them? Be firm and refuse funding your account. Make it clear that it’s against your wish to deposit into the account. Unfortunately once your info is with them you don’t have much say in removing the account. Also, monitor your card for the time being to make sure there’s no unauthorized charges (look out for charges cost at least $250). I filled in my details to get a login but I have not deposited £250 in the account. Will they be able to take money from me or should I be ok? Hi Kim, they’ll need to call you up and get your verbal consent before taking your money. So if you receive sales call from the broker, stand your ground and refuse to fund. Anyway, it’s safer to monitor your account for the time being for any unauthorized charges. I couldn’t log in to my account after signing up. Deposited $250 into the account and there’s no support for me to call. I may have lost $250 for signing up. Same thing happened to me! I called the broker support but instead of helping me withdraw, they say I have to deposit another $3000 and they’ll help me make $10,000 by the end of next week! They just don’t let me withdraw MY money! Just sign up and deposited 250$ ,but cannot log in,my password doesn’t work,no customer support to call.The deposit is pending on my credit card. Try calling your credit card bank to cancel the transaction. You may still be able to cancel it while it’s pending. Hi Kunal, they’ll call you to fund your trading account. Be firm and refuse, even if they offer trading bonus. If you do, it’ll be hard to withdraw your balance. In the meantime, monitor your bank account to spot any unauthorized charges, and contact the broker if any unauthorized funds are deducted. I have just paid £4.95 joining fee, will they be able to just take money out of my account when they want? Hi Charlotte, their account manager will usually call you and ask you to fund your account. Be firm and refuse funding and you’ll be fine. At the same time, monitor your bank account to make sure there’s no unauthorized charges. I just paid the £4,95 but didn’t activate my account yet. I received a phone call asking to activate it by phone and I didn’t . Can they take my money without my CVV card ? I didn’t give to them by phone . Hi Laura, don’t worry. They can’t take your money without the CVV number. They may call again, just be firm and refuse to fund your account. But i haven’t pay for $250 investment. Because i feel wrong about reading an article says that simple to join but no need to provide any fund. But after i join in, it say minimum $250 to start investment. But then since i provide my bank number and the 3 digit number, what should I do. Actually, the card inside only have roughly $30, it like i wanted to start something from “work from home” and don’t wanted to get cheated so I took out my money and left $30 inside to try it. Incase i get scam. Should I contact the bank and cancel the card? Incase when I bank in to my further use on this card, since they get my number and pin. Hi there, you card is a debit card? Make sure it doesn’t have credit features. If it gives you peace of mind to cancel it, by all means cancel it. Otherwise it’s better to wait for 1 to 2 months before you deposit money into the card. You’ll likely receive calls from them in the next few weeks to fund your account, be firm and refuse even if they bribe you with trading bonuses. If you are serious about making money online, you shouldn’t bother with Online Wealth Market at all. The reason he made you say that is so that they have a record of your verbal agreement if you make a dispute. If he calls you again, firmly tell them that you don’t wish to fund your account. Monitor your bank account and if there’s any unauthorized deduction (usually $250), contact the broker and ask for a refund/withdrawal. Don’t accept any “trading bonus” that they might offer. If you accept, you’ll most likely have to perform a certain number of trades before you can make a withdrawal. By then, all of your funds would’ve been lost. Should I invest 250 $ as deposit into online wealth syatem ? Please don’t deposit into Online Wealth Markets, it’s clearly a scam. but Ed, what about that story on Ebrahim Coetzee making R 462,844/Yr in His Spare Time on The Computer Without Selling Anything… is it also part of their tricks (online wealth market)??? Hi Tuks, can you give me a link to the article you read? It’s most probably a landing page of theirs disguised as news article to misguide the masses. As suspected, it’s a typical scam landing page. It’s just a page disguised as a news article to give it some credibility. Try this – click on ANYWHERE on the website (different sections, tabs, links) and all of them will link you to the scam itself. Does a legitimate news website link everything to a single webpage that sells you a program? There’s your answer. I also gave all my bank details and $250 has been deducted from my account .Now I am worried and want to know what should I do to get the refund. I have contacted my bank to reversed the payment but was informed that it will be effected “maybe” within 7 working days ” I was contacted by an Asian consulted who instructed me to deposit another $500.00 in order to be assisted by him or his senior brokers. Firmly reject the “consultant” who instruct you to deposit another $500. He’s just a sales manager from the brokerage. Try contacting support of the broker and request for a withdrawal of your $250. Don’t touch the money inside the account. thanks so much for your review! I was nearly fall into the trap by Online Wealth Market if didn’t see your post. By the way, I’m studying and I would like to ask your opinion would it suitable for me to give it a try on wealthyaffiliate as I have no basic in entrepreneurship and lack of capital ? Glad that the review helped you! Just give Wealthy Affiliate a try because it’s free to get started. This is one of the main reason it’s my sole recommenfation too. Is it safe to join on Wealthy Affiliate? What type of business is it? Will you sell products or other things there to earn money? Sorry if I have so many questions. After reading all the comments here about online wealth marketing I was so disappointed. Because I thought that it was a good opportunity to start with.I want to earn money by staying at home so I can spend my time with my family. Never buy into these “business opportunities” that promise to make you lots of money online without much work. Making money online is not as simple as they want you to believe. 1) Yes it’s safe to join Wealthy Affiliate. The starter membership is free, so you have nothing to lose if you watch the tutorials and decide not to work on it. 2) It’s about building affiliate marketing sites. 3) Yes, but you’re not selling products of your own. For example, you can create a site about fishing rods (if that’s your interest) and recommend products from Amazon. People click over to Amazon and you get a commission for whatever they buy within 24 hours. Do hit me up again if you have more questions! Monitor your bank statements closely within these few weeks to check for any unauthorized charges. If you do, contact the broker immediately for a refund. And if you do receive a call from the broker sales team, be very firm that you Do Not want to fund your account. I just fall into the trap, my credit card was charged for USD250, i have blocked the card. I have yet to sign up the trading central applicationand and not reply to the doc required, but they told me my account being open, what should i do to stop them proceed further. Appreciate your advice. Regards, Kelly. Hi Kelly, try contacting the broker to withdraw the fund. Don’t make any trade, and request for a refund immediately. Hi Maria, did you give them verbal consent to fund your account? However, since you’ve already provided the security key, it might be a good idea to block your card. I’ve came across and analyzed a ton of these scams, and unfortunately I was a victim myself before I even realized the existence of binary software scams. It took experience and research and uncover these. Oh…!i filled the form,gave them my phone number n email adress,except my bank details.Oops i was bout to fall ther,am i stil safe Ed? Don’t worry, as long as they don’t have your bank details you’re fine. However you’ll most likely receive calls from their sales managers to get you to fund your account. Just be firm and reject them. You can mail them, but in addition to that give a call to the broker and tell them you want to withdraw all your money. I called back but no one is answer. Hi Sicilia, try calling them on weekdays during working hours. Try multiple times if it doesn’t go through. Is Bell Capital a Fraud company? Bell Capital had been chasing me to invest into different port-folios. I am suspecting that this is a fraud group. Please advise. Hi, I haven’t done in-depth research into Bell Capital, so I can’t advise you on this for now. What type of port-folios are they trying to get you to invest? Oh no!! I’ve just fell for this completely. The reviews I read before coming to this page said it was all legitimate. I received a call, but the broker said he was going into a meeting & will phone me tomorrow. Have I lost the $250? I can’t say for sure if you’ve lost the $250, but keep an eye for your bank statement. If there’s indeed money deposited into your broker account, make every effort to withdraw them. Contact the broker. One thing to note is that there are a lot of fake reviews out there, because these scams offer commissions for their affiliates. Be careful and don’t buy into it if it sounds too good to be true. Hi Edward, i filled out the form in this online wealth markets but instead of giving them my credit card number, i gave them my savings account number. Can they go to my savings account without my permission and hack my bank account? They wouldn’t go as far as to hacking your bank account, but beware when you receive a call from their account manager. Be very firm that you do not wish to fund your account, or they’ll take the chance to help you make a deposit. Hi i just put my bank details in will they take money out my account im getting a home grant soon and dont want them to take money out my account. You will most likely receive a phone call from the broker, be very firm that you do not wish to fund your account. Monitor your account for the next one month to make sure there’s no unauthorized charges. Oh my god. I’ve already given all the information then I suddenly changed my mind then I found this. What shall I do? Did you receive a call from the broker? If you do, be very firm and tell them that you don’t want to fund your account. And continue to monitor your credit card statement for the next 1 month to make sure there’s no unauthorized charges. I’ve just done the same I want to cancel this. Should I just get my card blocked so they can’t get money out of my bank. You can definitely do that if you want to be extra safe, although that would be more of a hassle compared to just monitoring the credit card statement. Don’t worry, you are safe. You may receive some spam calls from time to time, just ignore them. If you didn’t answer any phone call you should be safe. However just keep a lookout for your credit card statement to make sure that no unauthorized charges are made. So as long as I didn’t answer any phone call I should be safe right? Cause I have been receiving a phone call from London when I am in Singapore. I believe so, their account manager needs to at least speak yo you for the deposit. Anyway, just monitor your credit card statement to make sure there’s no unauthorized charges to be safe. It’s good that you didn’t buy into the scam. Eventually i got money back after 1 month struggle. Good that you got it back! Becareful of shady internet opportunities in the future. Who are these people? Are they your personal friends? If they keep you in the dark but expect you to deposit money, it’s a big tell tale sign of a scam. DO NOT entrust your money to auto traders. Be it forex traders, or binary options traders. If you really aspire to be a trader, you should learn from the basics yourself and practice with demo accounts first. But if your goal is to make money online, there are better alternatives. Only a handful of active traders make money off the market. I nearly fell for this ad they kept calling me to fund the account and even promised to give bonus of $250 if I fund the account. But one thing I discovered myself is that on thier website if you read people’s comment saying they got money and praising them if you click on that name it will take you to another person’s FB profile meaning it’s a scam, that’s not a true revelation. You’re right,it’s indeed a scam. And don’t ever take up their deposit bonus, you’ll have difficulty withdrawing even if you don’t make any trade. I fell for the offer and gave some personal details like job and credit card. Can they take money from my account ? They keep calling me. What do you advise ? I’ve had other readers who got their money deducted without prior notice. You can see their comments below. I’ll advise you to monitor your credit card statement to make sure there are no unauthorized charges. If you receive another call from them, be very firm and tell them you have no intention to fund your account. I wish i had come across your page before, although i did do some looking into the Online wealth markets, but i fell for it and paid the £4.95 fee. i have not funded my account and gave not received any calls from them as yet. and im so glad i have not proceeded with it. Im just worried like all the others who have said they provided the card details to them to deduct the account fee. im so worried about them taking out of my account without my knowledge. It’s a correct move to take precaution and prevent unauthorized charging now that they have your card details. I’m glad this review helped you! Cancel your card and get bank to send you out a new one to be safe. Hi Edward, what will happend if I only go for the first step providing my email and phone number? If you did not provide any credit card details you’ll be safe. There’s no way they can charge you. However you may receive email spams and unsolicited sales call promoting spamming products. Its a pity that this information is not posted on all social media automatically on a monthly basis…..it would save people time money and stress…say, 150,000 people at 4.95 is 742,500 thousand dollars this is just a low estimate can’t the FBI get involved? Globally it could be millions on this arbitrary deposit of 4.95 dollars…….would you not say????? Can binary watch dog do some thing with FBI . Its disgusting to say the least….we just want to service in this economic climate! We need protection as consumers world wide…. Can this happen? What should i do now? It should be fine if you haven’t fund the trading account. You’ll most likely receive sales call from the broker to deposit and you’ll be offered bonuses. Just don’t fund it. Check your credit card statement to make sure there are no unauthorized charges (such as $250 charge, which is the min deposit for most brokers). But in most cases they won’t charge you without notice. Stay safe and let me know if there’s anything else I can help. Simply they will call and deduct the money without revealing about transaction. You were charged $250 without notice? What did they say in the call? Thank you for your comment regarding this matter. Do keep us updated. Through out the conversation they haven’t mentioned that they are going to do charge amount of 250$ on my credit card. Next day i haven’t got call from any representative. By the way now i’m unable to log into my account which i had earlier. It’s prompting error message. Thanks for the update. It’s terrible. Try opening a ticket with the broker’s support team to gain access to your account so you can request a withdrawal. I’m from South Africa, and I received a call from the Broker to start making money and only cost $250 to activate their Software. seeing you do not recommend Online Wealth Market, what is it you do recommend. You can see my recommendation at the end of this review. Don’t worry, you’re lucky as you haven’t made the deposit. Otherwise it might be a bit of a hassle to ask for refund. Since you’ve called up the credit card company you should be safe. Just check your credit card statement to make sure there are no unauthorized charges. Don’t be hard on yourself, I’ve fell into scams myself more than one time! It’s already good enough that you read reviews before committing the $250 deposit. Stay safe and let me know if there’s anything I can help. I have been reading ur comments and really thank u for ur help. 1. Is there any legitimate site/online work which by doing really pays off. 2. I am from India, please also let me know if it works in India or anything available in India. 3. If so, the procedure of doing so. The reason I ask so, because I have lot of free time which I waste always. I just want to do some legitimate non technical work online and get paid. 1) If you only want to do some freelance works, you can look into providing your service at fiverr, freelance.com or odesk. This is of course, provided you have a specific skill set people are looking for. 2) Most freelance jobs are global in nature. 3) You can sign up as a contractor/employee in any of the sites I’ve listed. Having said that, instead of trading time for money, I would recommend that you learn how to build your own online business. It will be a skill set you can use for your lifetime. Hey Lisa, I’m glad it helped you! Stay safe! I just logged on to this online business. I have even paid $ 250 through my credit card. Now after reading all reviews i am afraid that i will end up in some bad experience. please advise should i block my credit cards or wait until i get a call from Banc De Binary? You can file for a refund/withdrawal request with the broker. But I suggest that you follow it up closely because there have been complaints that the process is extremely slow. If you do accept a call from the broker, keep in mind not to accept any kind of trading bonus or it’ll be very hard to withdraw the sum, because you need to fulfill certain trade volumes. I think you don’t need to block your card yet if there are no unauthorized charges. Just monitor it. 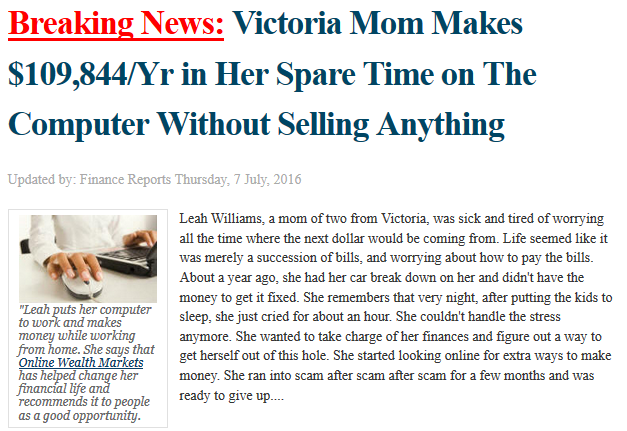 Unfortunately scams are thriving on the Internet. As consumers the best we can do is to stay vigilant. Unfortunately I too fall for this scam and filled out my details and credit card numbers. But I haven’t yet received any emails or phone calls and obviously don’t want them to! Perhaps because I live in Europe? I’ve have now blocked my credit card as well. Do you think that this will be sufficient to keep the banc from stealing money from me…? Thanks!! It may be a matter of time before they assign an account manager to call you. Anyway, now that you’ve blocked the card you should be safe. Just check your credit card statement to check if there’s any unauthorized transaction before you blocked the card. Just like many others I fell for this, partially though. I bought the program for £4.95, but after talking to broker I did not agree on proceeding. I’m worried now about my details they have. Can I log in to my account just to delete it? Or is it better not to do anything? Hi Kate, you can raise a request to close your trading account, but you’ll have to go through the account manager. You can’t just login and delete the account. To give yourself a peace of mind, it’s advisable to close the account. I have just given my card details to Online Wealth Market and got a call from Banc of Binary, but told them to call me back tomorrow as I got worried that it might not be a genuine business , I told them not to present my card for payment of £250 and will let them know if I will go ahead when I have enough money. Will they go ahead and take the money without my saying so? Please I am really worried now. For safety sake, keep an eye on your credit card statement for any unauthorized charges. When you receive another call from them, be firm and refuse to deposit into the trading account, even if they offer you free bonuses. If you see any unauthorized charges in your credit card, file a refund request with them immediately. Thank God I read your review and other peoples comment. I was so tempted to buy this. Hi Sunny, I’m glad the review helped you! Initially i filled my personal details and credit card with contact no. I gave my credit card details as it mentioned only one dollar. Next day i got a call from them . At the end of the call they deducted 250$ from my credit card with out my notice. 1. how to get refund the money. 2. It’s required to block the credit card? 3. will they do transaction on my card with out my notice? 1. Contact the broker for a refund. Unless they have a minimum trade volume to fulfill, you should be able to withdraw your deposit. 2. If broker is unwilling to process a refund, try to file a refund request with your credit card company. Provide the proof of contact with broker if necessary. 3. Monitor your credit card statement to see if there are other unauthorized charges. By the way, what is the name of the broker you were assigned to? Broker : Banc De Binary. I informed the broker through mail that transaction has processed without my notice. So far 12 hours passed, have not got reply . Only one transaction has been processed by the broker so far. Still i’m bit confuse how they did the Transaction of 250$ without my notice,sending OTP to my phone number. 1.Could you please let me know how they deducted without my permission. 2. Is Card no, CVV, Contact no. (which have been provided) enough them for deducting money from my card at any time with out my authorization. Banc De Binary is one of the more reputable brokers out there, so you shouldn’t have much problem withdrawing the fund if you did not accept any form of bonus during deposit. I was perplexed at how they managed to deduct money without authorization, too. But if they have the CVV number, it may be possible for them to deduct without OTP. If I were you I wouldn’t worry too much about Banc De Binary, just keep an eye out in your card statement for any unauthorized charges from Online Wealth Markets scam. Edit: After some research, it appears that Banc De Binary has quite a few complaints regarding withdrawal, even though they are regulated by CySEC. You may want to follow up with the withdrawal more closely. Would like to appreciate much for your thoughts. I’m interested investing in business. I don’t have knowledge of business related topics. 2. How to forecast. ..etc. Could you please guide how to start my career from beginning. You can read how I invest in stock market here and here. I don’t forecast/speculate the market. I just invest in low cost, diversified index funds and that will beat majority of managed funds in the long run. If you want to start a career from the beginning and is willing to put in the effort, I strongly encourage you to sign up for a free account with Wealthy Affiliate. You will be well served having an online asset that can generate income for you over the long term. they won’t refund or something? After doing a bit of research online, I saw numerous complaints from Banc De Binary users who have problems withdrawing their money from the broker. It’s not to say they won’t refund, but it’s better to follow up closely. Raising a refund request with credit card company like what you did may be the correct move in this case. My goodness! I’ve provided them with everything they’ve asked of me.. My bank card number, contact number.. Should i worry? Hi Jonathan, have you funded your account? You may receive calls from brokers and they’ll persuade you to deposit into your account. Just stand your ground and refuse funding and you’ll be fine. Thanks i haven’t funded yet. Hi Titus, I’m glad it helped you. I have gone far to a point that I’ve made the $250 payment and I’m not sure if I can get it back. I was told that I can exit anytime but don’t know how. What can I do? Hi Adam, you can try contacting your broker to withdraw your money. As long as there are no terms on minimum trades to fulfill, you should be able to withdraw the deposit. I fell for this. What can they do with the personal information that you entered? Hi Theresa, since you’ve opened a trading account, you’ll probably receive calls from the broker sales team to fund your account. And you’ll most likely be offered bonus if you make a deposit, just stand your ground and decline their offers. I made the mistake of buying the programme for 4.95. Does this mean I now have to pay 250??? I don’t want to use it at all now I’ve read this. Please advise as I’m worried. You don’t have to pay $250. Just don’t fund your account with your broker and you’ll be fine. I have the same case as Rachel Capon. Can the do anything with my Credit Card details? Will they take money without my permission of my credit card? Please advised. I’m sor worried now. Hi Priska, don’t worry, they won’t be able to make unauthorized charges to your credit card. If you’re worried, you can check your credit card statement next month to make sure every charge is accounted for. I strongly urge you against joining it. This is clearly a scam, I myself have bought into binary trading software previously and regretted it. If you really want to make money online and are willing to work on it, Wealthy Affiliate will bring you much further. Edward hope you too are not working for them……please tell us more about yourself? Hi James, I wouldn’t have written this article if I’m working for them. You can check “about me” section if you want more information of myself. Hi Edward, I give my master card info but there is no money in the account because I must transfer money into the account. Does this mean I now have to pay the 250$ I don’t want to use it at all now I’ve read this. Please advise as I’m worried. Did you receive any call from the broker asking you to fund your account? If you do, reject them firmly. They need to get your approval before they can deduct money.